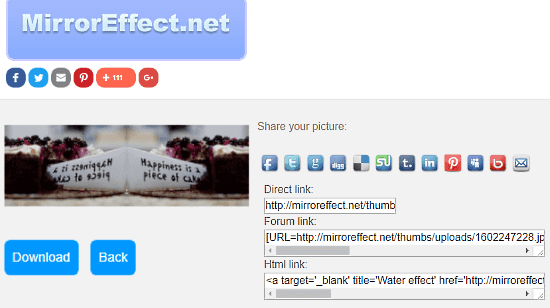 This article covers 5 free websites to generate mirror image online. With these online tools, you can easily make a mirror image of your photo. A mirror image of a photo is that same photo flipped horizontally or vertically. Using an online tool to generate a mirror image is very time efficient and saves you from the hurdles of downloading and setting up big bulky photo editing software. With these websites, you can instantly generate mirror images within your internet browser and can download them to your computer. ImgOnline is a free online platform which is designed for high-quality processing of JPEG photos. Here, you can edit EXIF, IPTC, XMP data and can also apply a variety of effects to your photos. One of those effects is ‘Mirror Reflection‘, which you can use to generate a mirror image of your photo. To do so, first, upload your photo; JPEG, PNG, BMP, GIF, and TIFF are the supported image formats here. Then, select a mirror reflection for your photo; you can create a horizontal as well as a vertical mirror reflection of your photo. After that, select an output image format for your photo and click ‘OK‘ to generate the mirror image. You get two options for the output image format, PNG, and JPEG. In case of PNG, it generates a non-compressed image with transparency. 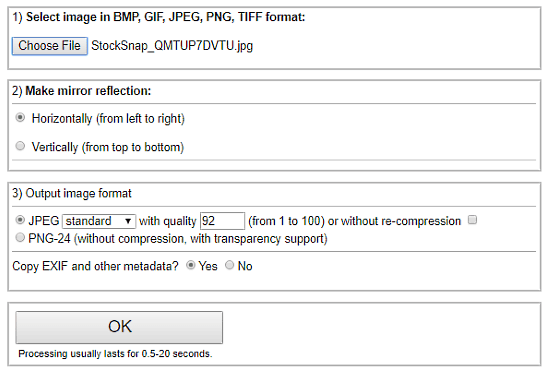 And, in case of JPEG, you get options to enable/disable re-compression and adjust the quality of the image. It also gives you an option to copy the EXIF and metadata in the mirror image as well. Give this online mirror image maker a try here. 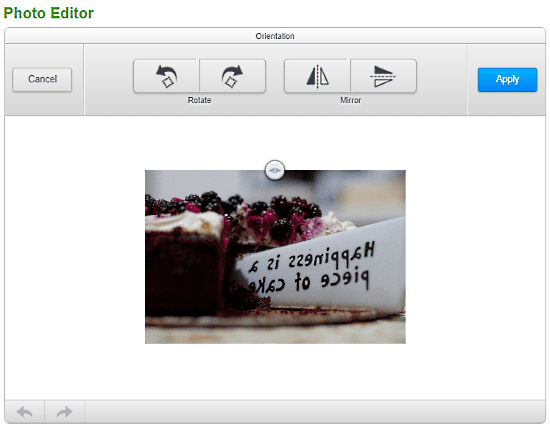 FunPhotoBox is an online photo editor with a variety of effects and animations. You can use this photo editor to generate mirror image online. The process is very simple; first, you have to upload your photo to the editor. You can upload a photo from your local storage or can import one from your Facebook profile. Then, go to the Orientation section where you can find the mirror tool. There, you can generate a horizontal mirror image or a vertical mirror image of your photo. After generating mirror image, you can download it to your computer. Try this online mirror image maker here. 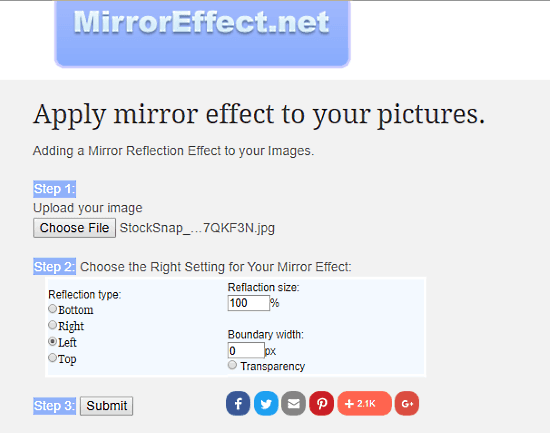 MirrorEffect is a dedicated mirror image generator website. Here, you can easily add mirror effect to your photo by uploading it here. This website offers 4 mirror reflection types which you can add to your photo. It also gives you options to adjust the reflection size along with boundary width of your photo. You can enable transparency in your final photo as well. This website does not generate a separate mirror image, instead, it extends the original image with the selected reflection type. I selected the left side reflection for my photo and the result of that is shown in the screenshot below. Generate mirror image online with MirrorEffect here. You can easily generate a mirror image online with popular image editor LunaPic. To do so, open LunaPic website, go to Adjust tab and select Mirror option. Then, simply upload your photo from local storage to generate its mirror image. You can also load a photo from cloud by mentioning its URL. 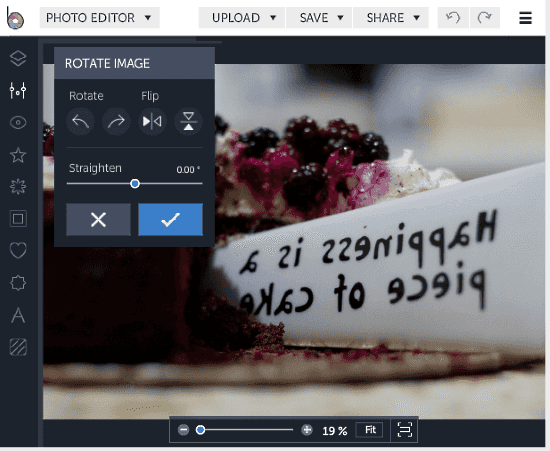 As soon as your photo uploads, it generates its mirror image and shows you a real-time comparison of the mirror image with the original photo. From there, you can download the mirror image to your computer and can share it on social media directly from the editor. Generate mirror image online with LunaPic here. BeFunky is another popular online photo editor where you can generate a mirror image of your photo. 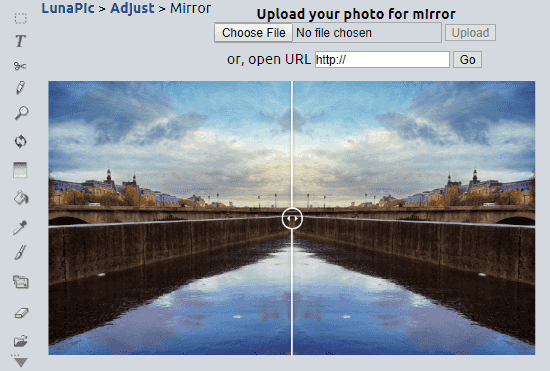 To generate mirror image with BeFunky, upload your photo to the editor, then click on Edit tab and select Rotate. This will open a ‘Rotate Image‘ tab on your screen. From there, you can generate a horizontal or vertical mirror image of your photo with the ‘Flip‘ option. Then, with the ‘Save‘ option, you can download the mirror image to your local storage. You can also upload it to Facebook, Google Drive, or Dropbox right from the editor. Try BeFunky to generate mirror image online. All these websites offer great tools to generate mirror image. You can use any of them to generate mirror image online. Try them yourself and share your experience with us in the comments.